All Led Zeppelin items listed below are authentic and very limited. We do not carry multiple items. All prices and availability are subject to change. All prices include shipping and handling for all USA customers. All other destinations will require actual shipping cost to complete transaction. Have a question? Ask us before purchasing the item. Thank You. 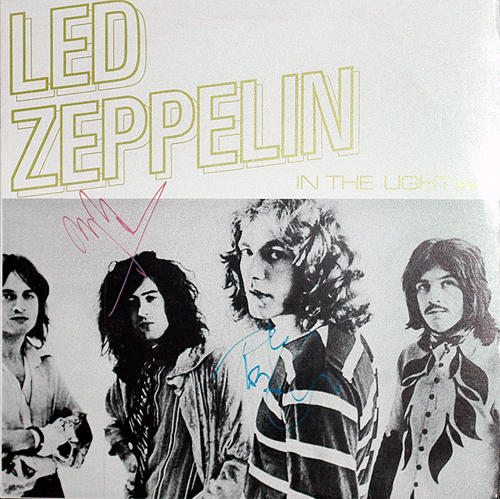 Note: Item signed by Jimmy Page in 1986 and Robert Plant in 1985. Both were signed in blue and red paint pen. 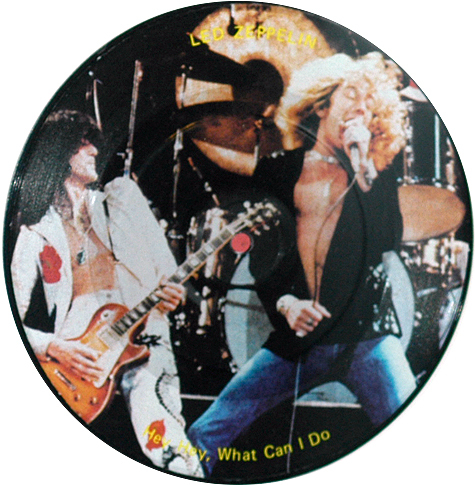 Description: Super Rare "Hey Hey, What Can I Do" 45 Picture Disc. 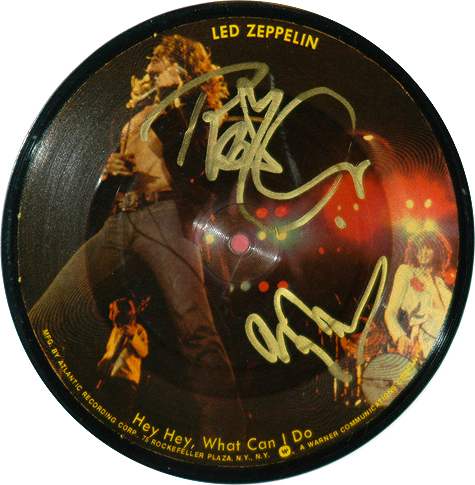 Signed by Jimmy Page and Robert Plant in gold paint pen. Super Rare Bootleg 45! Note: Item signed by Jimmy in 1983 and by Robert in 1985. At the Mandalay Hotel lobby in Irving, Texas. 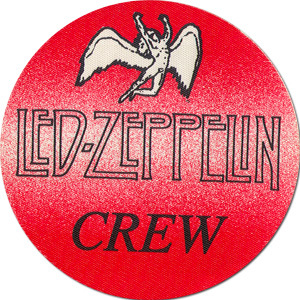 Description: Led Zeppelin 1977 Tour Crew Pass. Item in mint condition. 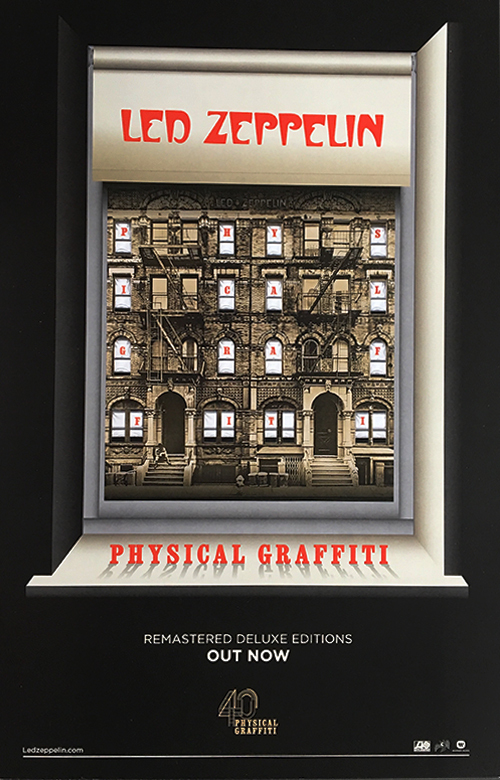 Description: 1995 Led Zeppelin Photo Book. Small format. Color and BW photos. 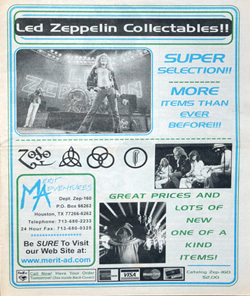 Description: 1994 Led Zeppelin Merrit Adventures Led Zeppelin Collectibles Magazine. Price guide and info. 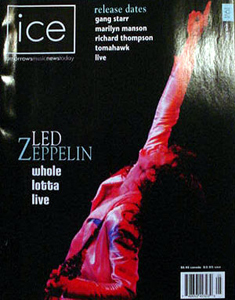 Description: 2002 Ice Magazine featuring Led Zeppelin. 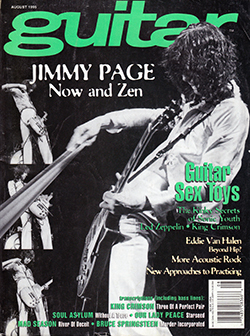 Description: 1991 Guitar For The Practicing Musician Magazine featuring Jimmy Page. 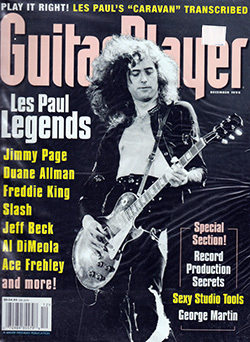 Description: 1995 Guitar Magazine featuring Jimmy Page. 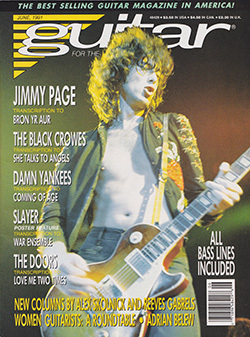 Description: 1998 Guitar Player Magazine featuring Jimmy Page. 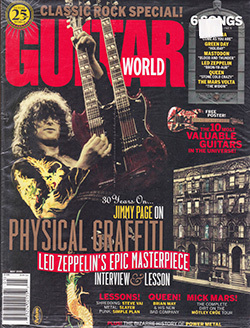 Description: 2005 Guitar World Magazine featuring Jimmy Page. 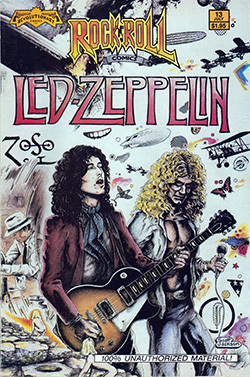 Description: Rock n' Roll Comix Book featuring Led Zeppelin. 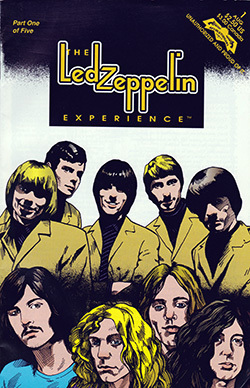 Description: Led Zeppelin Experience Comic Book. 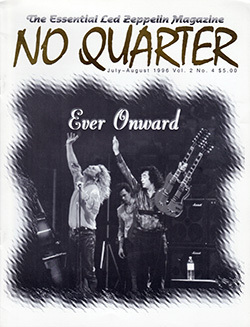 Description: 1995 No Quarter Led Zeppelin Fanzine. 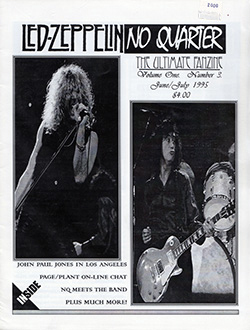 Description: 1991 Early Days & Latter Days Led Zeppelin Fanzine. 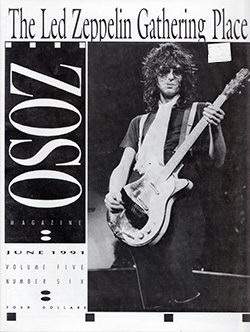 Description: 1991 Zoso Led Zeppelin Fanzine. 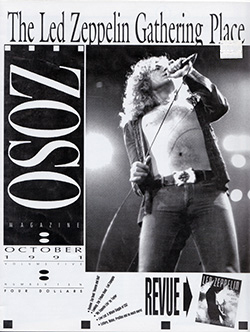 Description: Year Six Number 1 Zoso Led Zeppelin Fanzine. 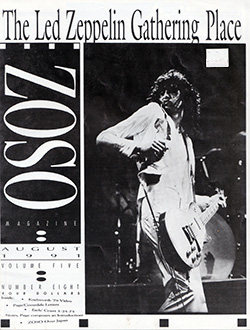 Description: Year Six Number 3 Zoso Led Zeppelin Fanzine. 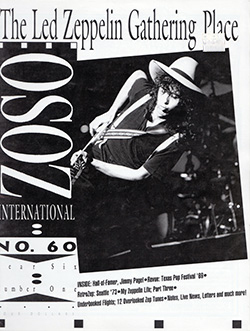 Description: 1995 Live! 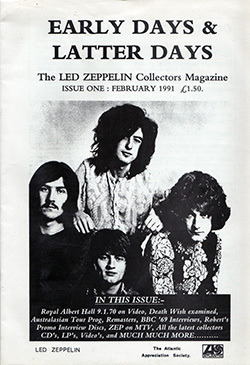 Magazine featuring Led Zeppelin. Description: Authentic Rainbow TicketMaster used bank check. Paid for Led Zeppelin Concert Ticket Refund. Check signed by Rainbow TicketMaster President. 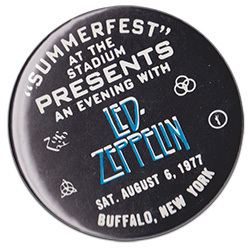 Description: 5" Round Led Zeppelin Concert Button. 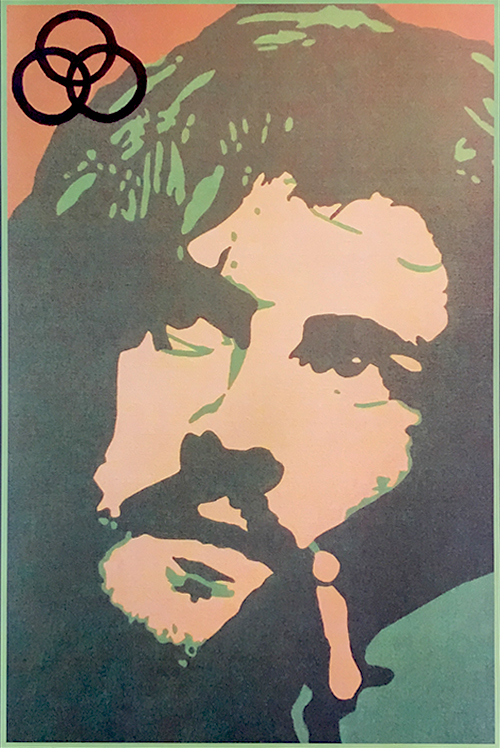 Summerfest August 6, 1977 Buffalo New York. 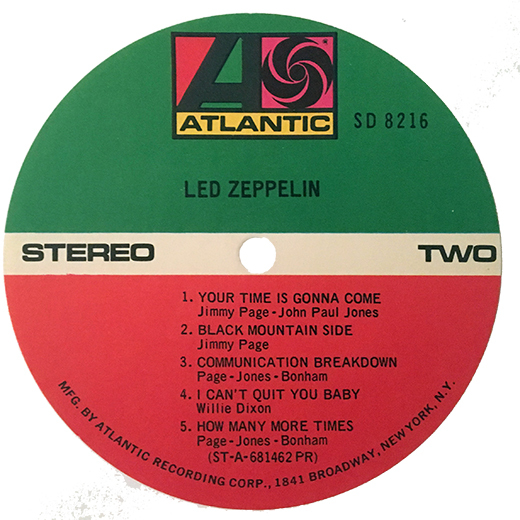 Description: Led Zeppelin - Debut LP Atlantic Record Label. This is an UNUSED side two label with the backside glue untouched. Item in near mint condition. 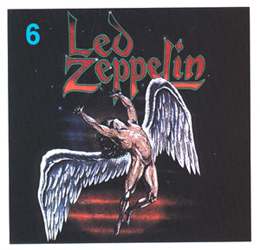 Description: 5x5 Led Zeppelin Swan Song Sticker. 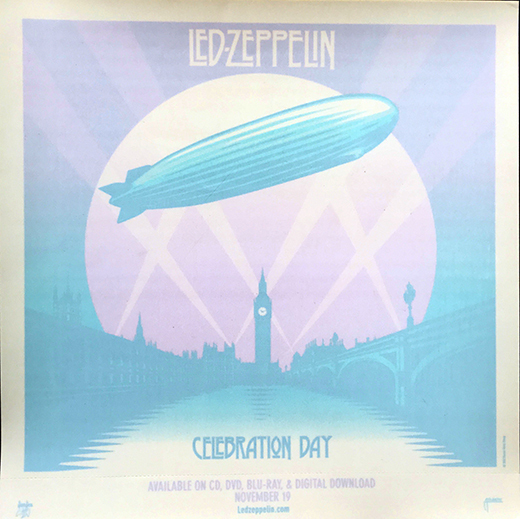 Description: 10x10 Celebration Day Promo Window Sticker. 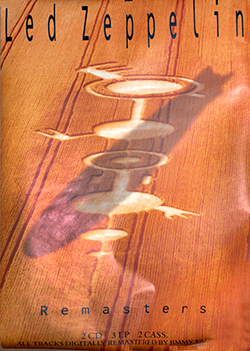 Description: 10x13 Mothership Promo Window Sticker. 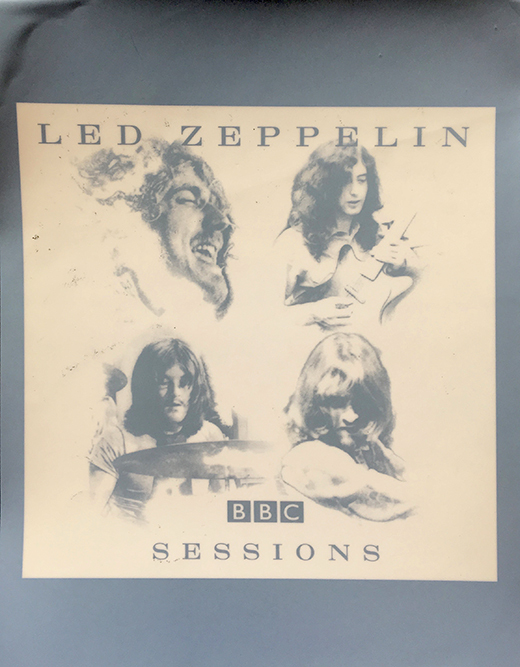 Description: 10x13 BBC Sessions Promo Window Sticker. 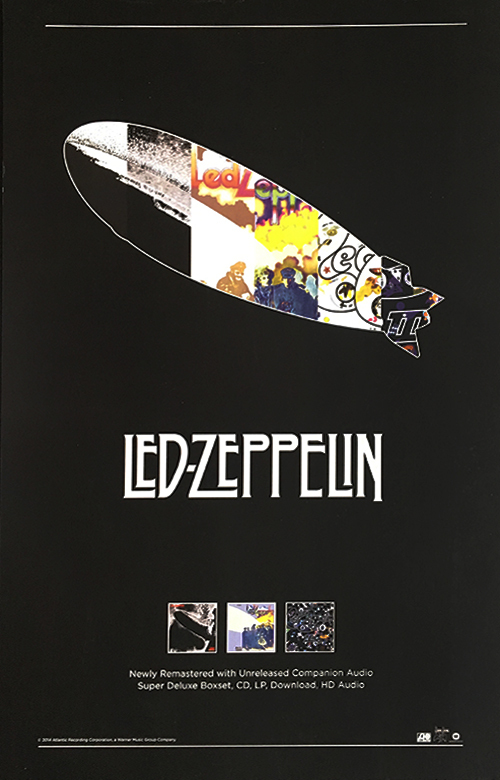 Description: Led Zeppelin - III LP Sticker. 3" Round Color. 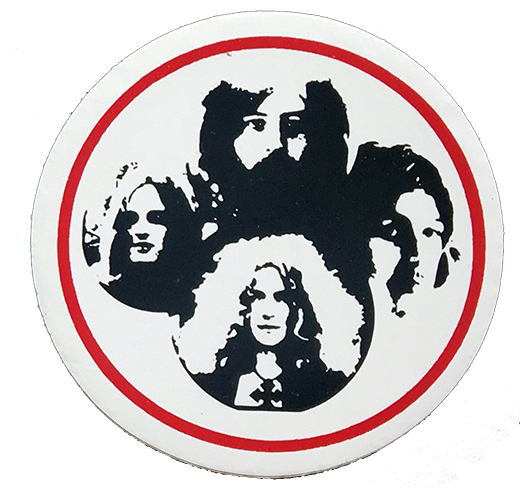 Description: Led Zeppelin Symbol Window Sticker. 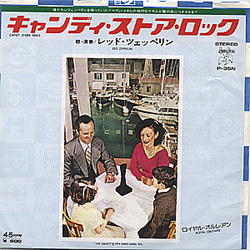 Description: Led Zeppelin Four 33 LP. Limited Edition Russian Pressing. Item in mint condition. Description: Promo only radio CD. 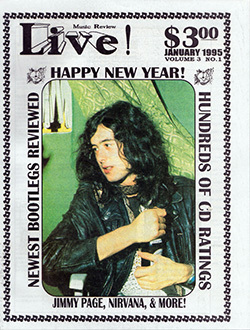 Contains interview with all three band members, radio station call outs by Jimmy Page. Item in mint condition. 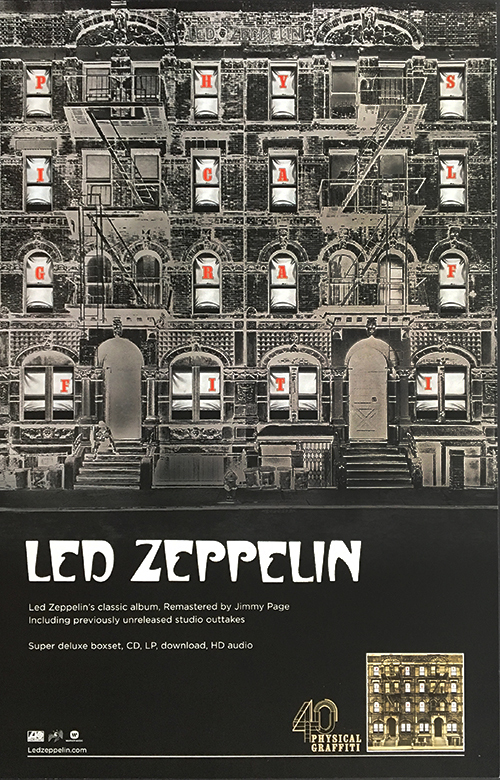 Description: Led Zeppelin Remastered 4 promo song sampler. 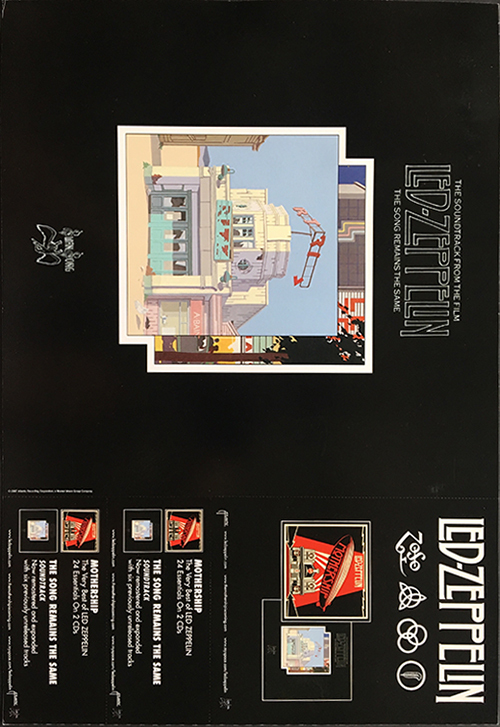 Limited Edition Zeppelin box. Item in mint condition. 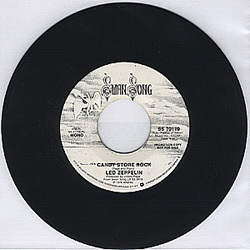 Description: Led Zeppelin Candy Store Rock promo 45 rpm. Item in mint condition. 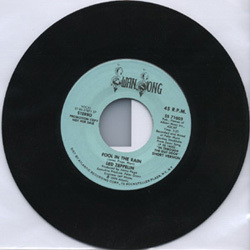 Description: Led Zeppelin Fool In The Rain Italian 45 rpm. Item in mint condition. 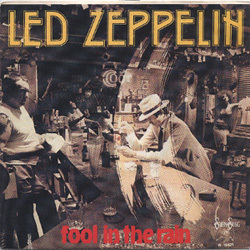 Description: Led Zeppelin Fool In The Rain promo 45 rpm. Item in mint condition. 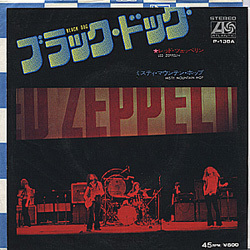 Description: Led Zeppelin Rock and Roll Japanese 45 rpm. Item in mint condition. 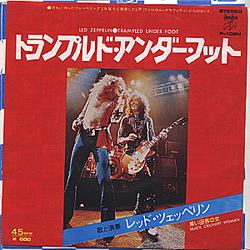 Description: Led Zeppelin Tramplet Underfoot Japanese 45 rpm. Item in mint condition. 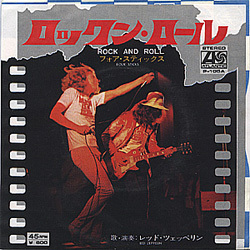 Description: Led Zeppelin Candy Store Rock Japanese 45 rpm. Item in mint condition. Description: Led Zeppelin Black Dog Japanese 45 rpm. Item in mint condition. 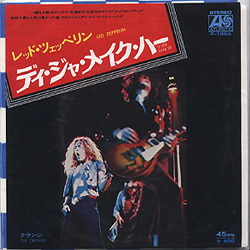 Description: Led Zeppelin Whole Lotta Love Japanese 45 rpm. Item in mint condition. 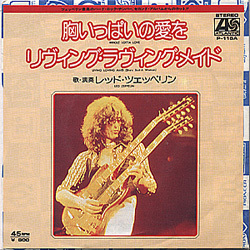 Description: Led Zeppelin Misty Mountain Hop Rock Japanese 45 rpm. Item in mint condition. 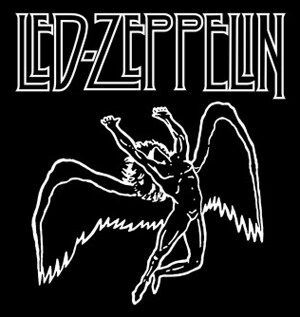 Description: Led Zeppelin The Song Remains The Same Concert and Beyond. Beta video tape. Original tape and box. Description: The Slog Black Dog UK 45 rpm. A compile montage version. Item in mint condition. Description: Blonde On Blonde Whole Lotta Love UK 45 rpm. Limited Edition picture disc. Item in mint condition. 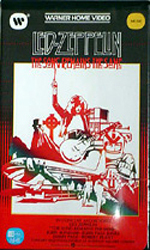 Description: Check out our limited selection of Led Zeppelin photos! Collection of various shows from 1969 thru 1985. 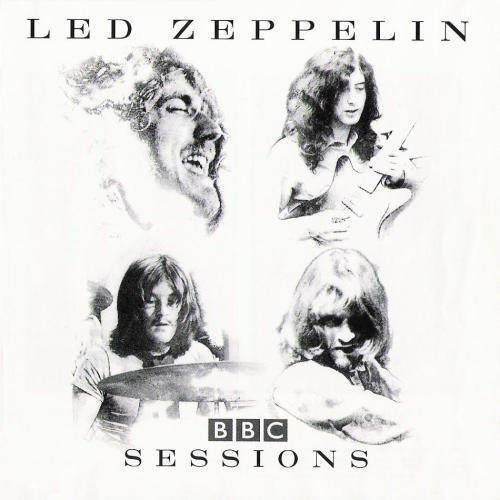 Description: Led Zeppelin BBC Session 1969 Promo Album Flat with Raised Artwork. Item in VG+ condition. 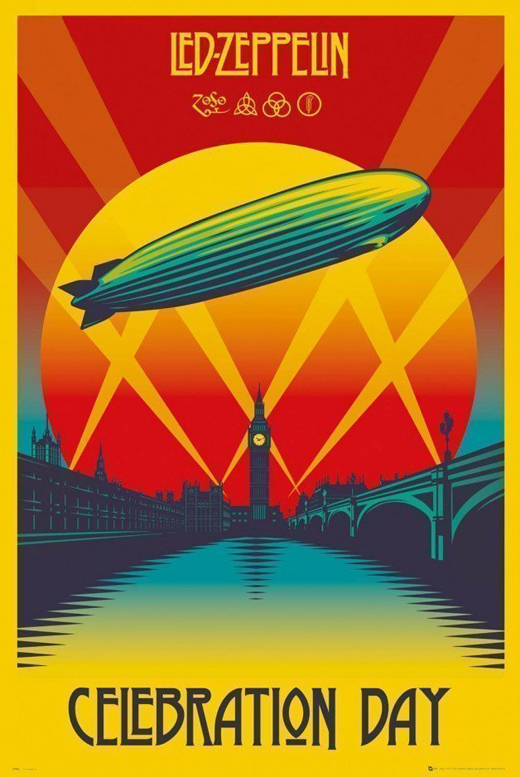 Description: Led Zeppelin Original 2014 Celebration Day Promo Poster. Size 11x17. Item in VG+ condition. 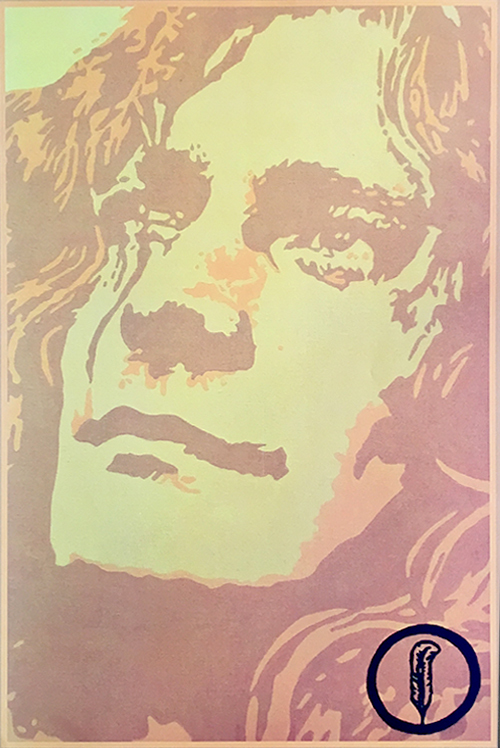 Description: Led Zeppelin - I II III Remastered Promo Poster. 11x17 Heavy Stock Paper. 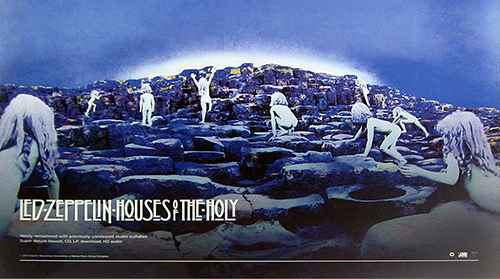 Description: Led Zeppelin Original 2014 Houses of the Holy Promo Poster. Size 11x17. Item in VG+ condition. 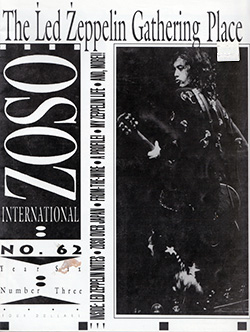 Double Side with Led Zeppelin IV Stairway To Heaven gate-fold design on the opposite side. 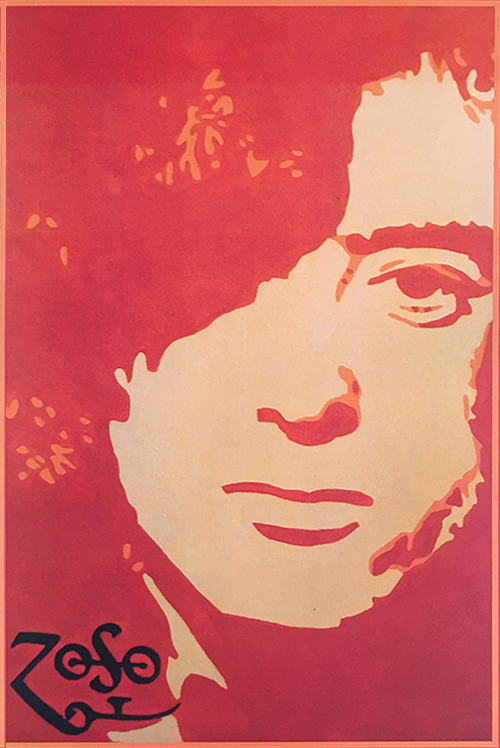 Description: Led Zeppelin Pyhsical Graffiti Remastered Promo Poster. 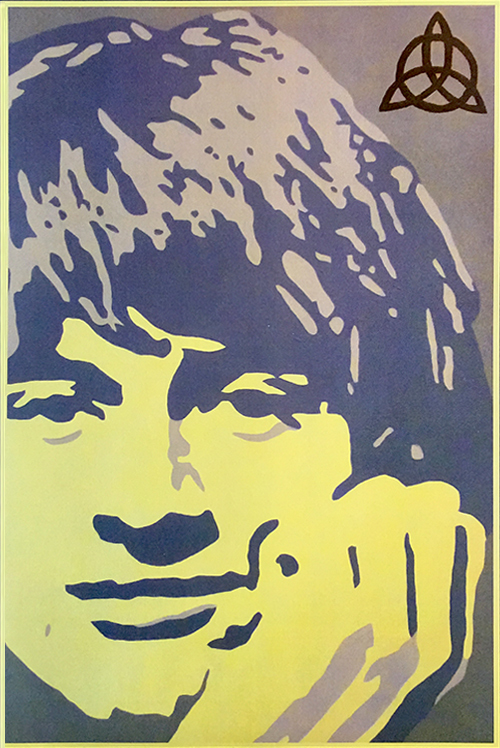 11x17 Heavy Stock Double-Sided Poster. 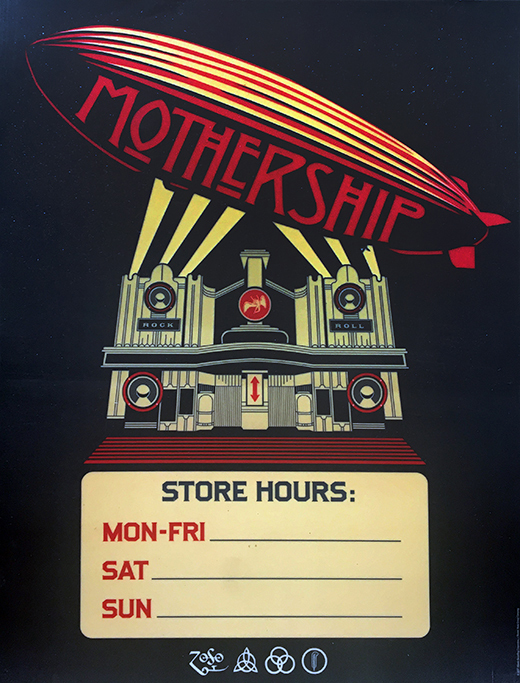 Description: Led Zeppelin Mothership Promo Poster. 12x18 Heavy Stock Double-Sided Poster. 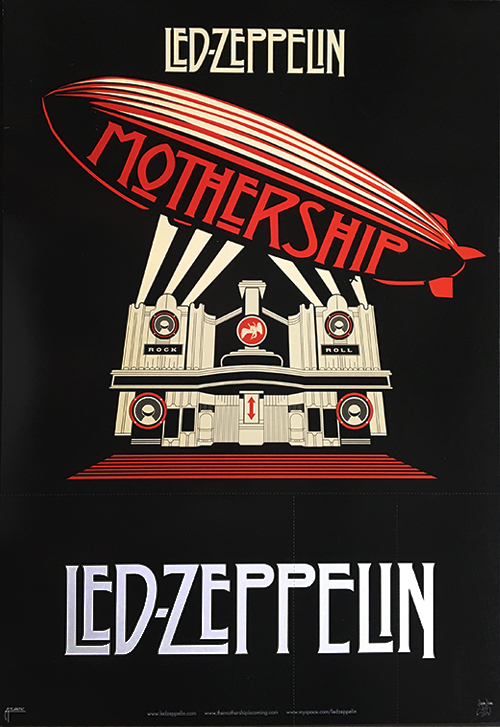 Description: Led Zeppelin Bootleg Symbols Posters. Size 11x17. Item in VG+ condition. Sold In Set Of Four!